A dislocation means at least one bone is completely out-of-place. Most likely, the two forearm bones ( radius and ulna) separate from the arm bone ( the humerus). When it first happens, it is usually an intense event. Most people need help to put it back in place (called closed reduction). After the ball is put back in place, it may need to be protected for some time. After a period of protection, it is important to regain motion to prevent future stiffness. If the tissues have been substantially injured, or if there is a fracture involved, the elbow may become unstable and prone to partially dislocate on its own ( subluxation). Elbow dislocations are not common. They typically occur following significant injury. 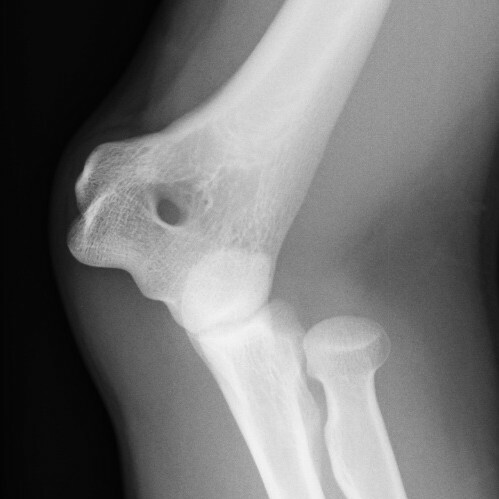 An X-ray is necessary to find if there is a fracture, as treatment varies depending on whether a fracture is involved. In the most severe dislocations, the blood vessels and nerves that travel across the elbow may be injured or soft tissues may get trapped in the joint area. If this happens, the joint may not fall back in place with manual reduction, and there may be a risk of permanent damage including losing the arm. In general, most patients recover smoothly following reduction of an elbow dislocation.